When I first started this blog in 2013, I was keen to post lots of different culinary experiences as well as my own cooking efforts. So writing up a great meal is obligatory! We had a memorable breakfast back then, cooked in the beautiful Hunter Valley, one of the best wine districts in NSW, if not in Australia, on a weekend retreat. The brekkie was cooked by “the doctors”, two of my oldest and dearest friends. They cooked Bill Granger’s buttermilk pancakes and French toast, and the link to that post is here. Here we are in 2018 and the doctors have done it again, cooking Bill’s buttermilk pancakes for breakfast, this time in Terrigal, a beachside locality on the central coast of NSW. The doctors have wisely decided to make Terrigal their other home, and we were lucky enough to have a relaxing weekend at their new abode. Stir the flour, baking powder, salt and sugar together in a bowl. Add the eggs, buttermilk and melted butter and whisk to combine. Heat a large non-stick frying pan over a medium heat and brush a small portion of butter over the base. For each pancake, ladle 1/3 cup of batter into the pan and cook for about 2 minutes, until bubbles appear on the surface. Turn the pancakes over and cook for another minute. Transfer to a plate and keep warm while cooking the rest of the pancakes. Posted in Breakfast, Pancakes, Crumpets and Waffles, Sweet Food and tagged buttermilk, fruit, maple syrup, nutella, yoghurt. Bookmark the permalink. It’s blood orange season and I love finding opportunities to use this beautiful fruit with its gorgeous colour and fragrant flavour. I made blood orange friands recently – here is the link to the post. This is a super easy breakfast recipe which could translate into dessert with ease! The sorbet is made by blending frozen blood orange segments with yoghurt – instant frozen delight. Add some granola, store-bought or home made, and any fresh fruit you fancy and you have a zingy, taste-bud tantalizing breakfast to start your day. Here’s the recipe or the assembly – it’s pretty easy! Peel and segment a blood orange, place on a plate, cover with cling wrap or a ziplock bag and freeze for at least a few hours or overnight. Put the frozen segments into a food processor or blender with a couple of tablespoons of full fat yoghurt. The exact quantity is up to you – start off with a couple of spoonfuls, you can always add more for a creamier texture. Blend well until you have a sorbet like consistency. You should wack the sorbet back in the freezer if you are not serving absolutely immediately – it does melt fast! Pre-heat the oven to 160 degrees C. Line a large baking tin with baking paper. You need to be able to spread the mix out without too many piles. Mix the oats, seeds and nuts together in a large bowl. Pour the warmed honey onto the mix and quickly stir it through. The mixture will be quite sticky, so stir fairly aggressively. Sometime I loosen the honey before microwaving with a little bit of water to make it more runny and easier to mix. Up to you. Bake in the oven for 10-15 minutes or until the mixture is golden brown and thoroughly toasted. You will need to turn the mixture over half way through cooking, so that the underneath mixture gets its time on top and gets toasted. The oven time is a bit of guess work – just keep checking and remove when the mix is golden and not burnt! Put a big spoonful or two of granola on a plate and scatter on some fresh fruit – more blood orange slices, and some strawberries and raspberries work well. Lastly, add as much of the blood orange sorbet as you want to the plate, and you have a lovely breakfast to go. Posted in Breakfast, Dessert, Ice Cream and tagged brunch, frozen fruit, honey, muesli, nuts, yoghurt. Bookmark the permalink. I get to work quite early and really enjoy having breakfast at work after I’ve done the first round of emails. I bring in all sorts of tasty treats – home baked sourdough, treacle soda bread, fruit rolls and scrolls, all with lots of my jams and marmalades, and different combinations of cereals, muesli and granola that I put together in the store cupboard for quick breakfasts. My latest addiction is Bircher muesli, piled into jars with fresh fruit, nuts, seeds and anything else I fancy, plus a drizzle of honey. This becomes a Bircher Muesli Trifle. The basic muesli can be made on the weekend, enough for the week, and the individual jars or pots put together in the morning ready for transportation to work. Just add some milk to pull the whole thing together. An incredibly easy, tasty and very healthy breakfast! Here is the basic recipe for the Bircher muesli, and my suggestions for what to layer your trifle with. The quantities will make 4 jars. Just multiply for bigger amounts. Combine oats, yoghurt and grated apple or pear in a bowl. At this stage you can cover and store in the refrigerator for up to 5 days, or you can use straight away. When you are ready to make your jars, start layering. It really doesn’t matter what order you use. I start with fresh fruit first as it’s much easier to turn out the trifle into a bowl – if you go Bircher first, it tends to stick to the bottom of the jar! Suggested order – fruit, Bircher, fruit, nuts, seeds, honey. Pop the lid on tightly and that’s it! When you’re ready to eat, loosen with a splash or more of semi-skimmed milk. You can eat straight from the jar or tip into a bowl. Depending on how hungry I am, I sometimes add a banana or a chopped apple to the bowl. That makes a really substantial breakfast to get me through the day. Posted in Breakfast, Healthy and tagged breakfast-on-the-go, cereal, fresh fruit, healthy, yoghurt. Bookmark the permalink. Granola Dust is from Jamie Oliver’s Everyday Super Food. It’s basically a granola mix blitzed in the food processor until the mix becomes pulverized. Great for serving with fresh fruit, or just sprinkling over muesli to add another texture. I love adding Granola Dust to muffins as I did in my last post, Blueberry Granola Dust Muffins. They taste quite nutty, and healthy! In the photo above, I made a breakfast trifle by layering mixed berries, Greek yoghurt and Granola Dust with a drizzle of honey, in a jar. You could do the same thing in a bowl. These quantities for Granola Dust are what Jamie specifies in his book. I thought that sounded rather a lot, so I made a quarter of the mix – this gave me half a large jar’s worth of Granola Dust. Preheat the oven to 180 degrees C. Place the oats, nuts and seeds in a large baking tray. Toss together and roast for 15 minutes, stirring halfway. 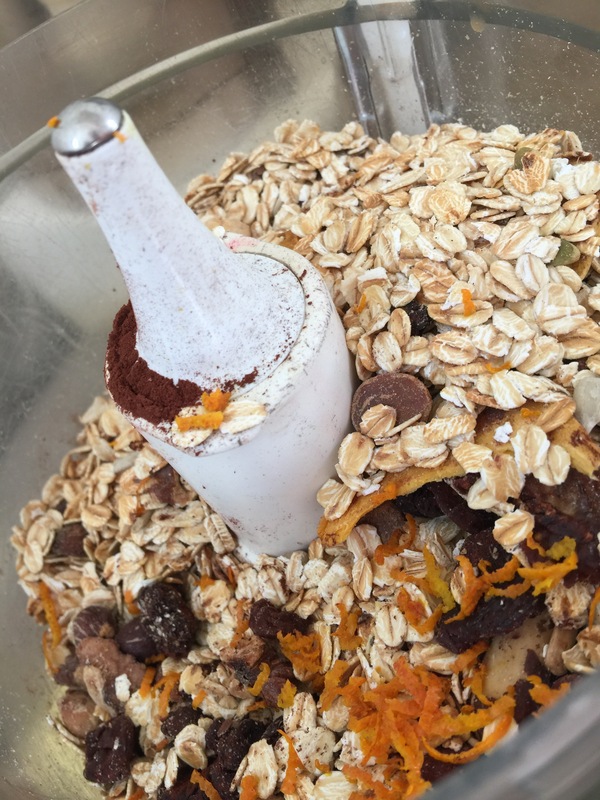 Stir the dried fruit, cocoa and coffee into the mix, finely grate over the orange zest, then in batches, blitz in the food processor till the mixture forms a rough powder or dust. Transfer to a large glass jar (or jars) to store. Posted in Breakfast, Jamie Oliver, Vegetarian and tagged berries, breakfast trifle, Everyday Super Foods, honey, Jamie Oliver, yoghurt. Bookmark the permalink. He has much to say about, well, how baking works, and lots of tips for the trickier aspects of baking. I thought I had muffin-making down pat, using The Moosewood Cookbook recipe which has been my staple since forever, but James’ tips about weighing all ingredients, even the liquids, and a few other good pointers, have given me some inspiration to try his muffin-making method from the above book. To make a really healthy muffin, I substituted wholemeal flour for white, added Granola Dust – Jamie Oliver‘s pulverized granola mix from his Everyday Super Foods – and lots of seeds. I substituted honey for sugar. 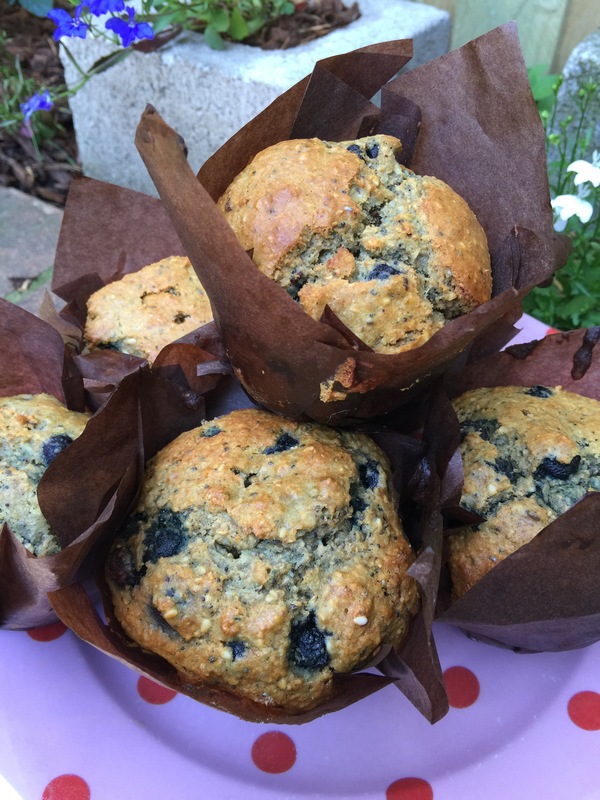 A very tasty and fruity muffin and good for you too! 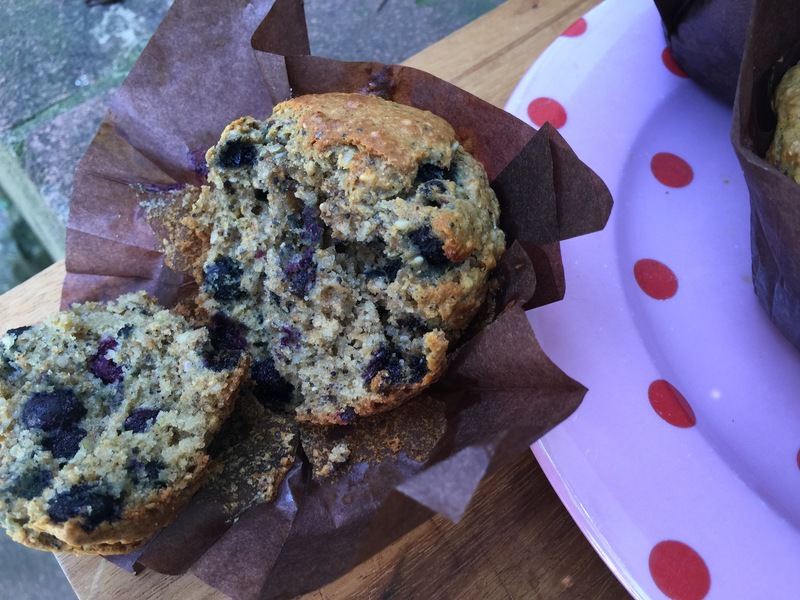 But you could use sugar, and completely leave out the Granola Dust and seeds if you like – they both add texture and a nice nutty taste but are not essential – and this recipe still produces a great blueberry muffin. Maybe bump-up the flour by 20g if you leave out the Granola Dust and seeds. Preheat your oven to 180 degrees C, 160 degrees C fan-forced. Line a 12 hole muffin tin with muffin papers, or grease the tin with butter or oil spray. In one bowl, add the flour, baking powder, bi-carb, salt, Granola Dust and seeds, mixing carefully to integrate the dry ingredients. Add the blueberries and mix to coat the fruit. Be careful not to break up the fruit. In another bowl, whisk together the sugar, egg, milk, yoghurt and sunflower oil. Pour all the wet ingredients into the dry ingredients and, using a wooden or large metal spoon, gently mix everything together. Make sure all the floury mix is combined, but be careful not to over mix. No flour should be visible, but the batter should still seem lumpy. Divide the mixture evenly into the papers or tins, and bake for about 20-30 minutes depending on the size of the muffins (bigger muffins take longer). When done, they should be golden brown and should bounce back when pressed firmly. Or carefully insert a skewer into the centre of the muffin and see if it comes out clean the muffins are cooked. Cool the muffins in the tin before eating, advice I’m not particularly good at heeding! 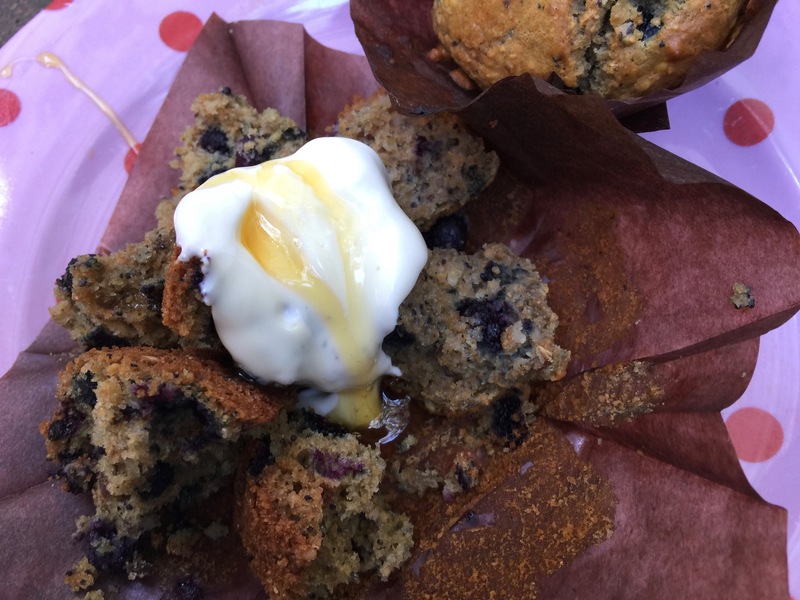 I served my muffins with Greek style yoghurt and honey. Healthy and delicious. 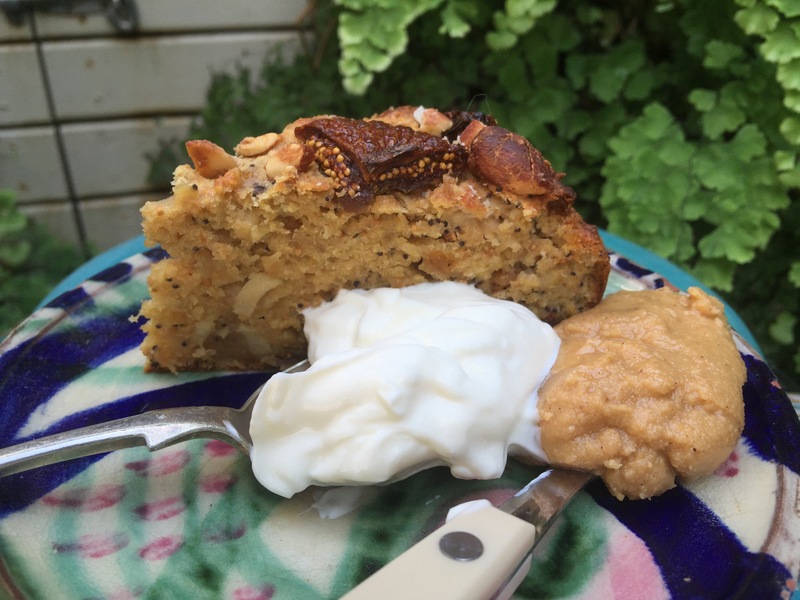 Posted in Jamie Oliver, Muffins, Small Baked Things, Sweet Food, Vegetarian and tagged chia seeds, Everyday Super Foods, Granola Dust, honey, James Morton, Jamie Oliver, linseeds, poppy seeds, sesame seeds, The Moosewood Cookbook, yoghurt. Bookmark the permalink. Another lovely recipe from Jamie Oliver’s healthy cookbook Everyday Super Food. 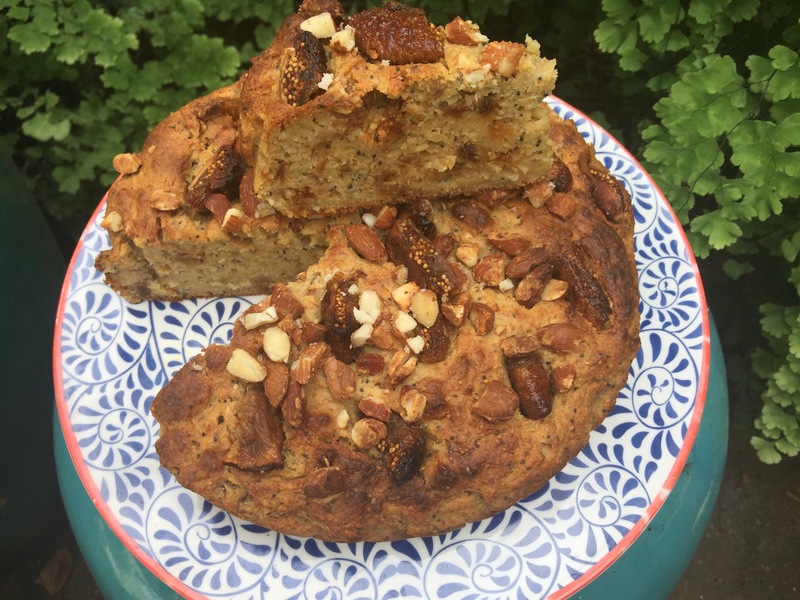 It’s a banana bread that is very flavoursome and sweet with remarkably, no sugar! The sweetness comes from the bananas, dried figs and apple. 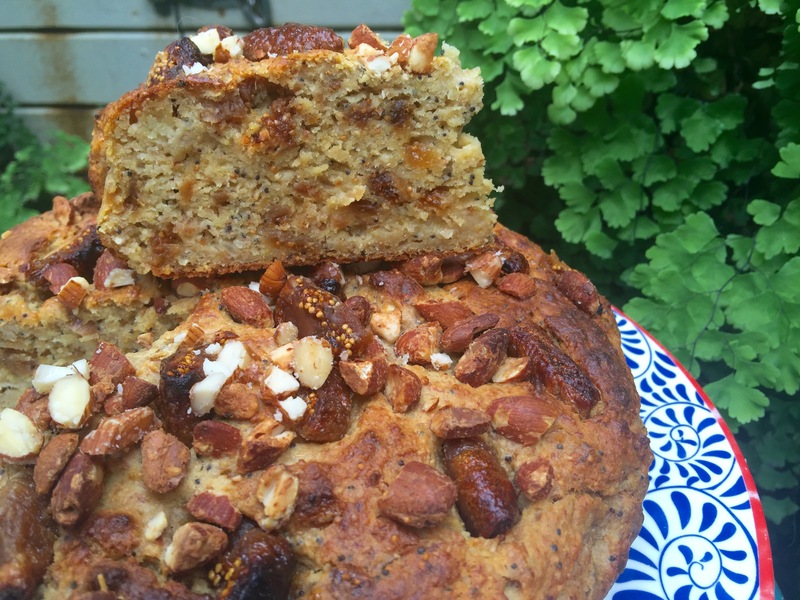 This quirky writer has a sweet tooth, and this recipe really satisfies me. Reading and cooking recipes from Jamie’s book I’m appreciating that cooking with healthy eating in mind doesn’t mean cutting down on deliciousness. 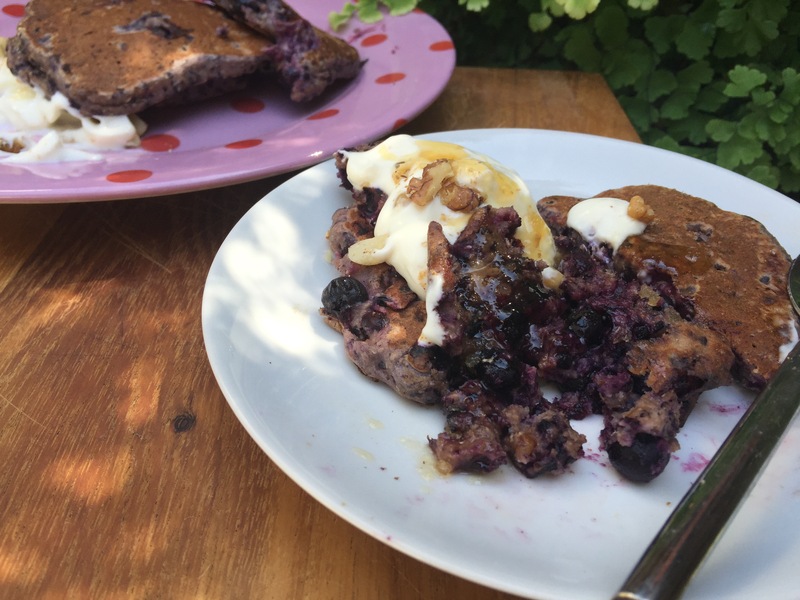 Jamie’s Smoothie Pancakes full of blueberries that I cooked recently, are luscious, sweet and satisfying. Place 200g of the figs in food processor with the oil, yoghurt, vanilla extract, peeled and roughly chopped bananas and eggs. Blitz until smooth. Add the flour, baking powder, ground almonds, poppy seeds and turmeric and pulse until only just combined. Coarsely grate and then stir in the apple. Spoon the mixture into the prepared tin and spread out evenly. Tear or chop the remaining 50g figs into pieces. Scatter over the mixture, pushing them in slightly. Chop the almonds and scatter over. Bake for 35 to 40 minutes or until until a skewer inserted into the bread comes out clean. Transfer to a wire rack to cool. Serve as is, or with any combination of yoghurt, honey and home-made nut butter. I made brazil nut butter to serve with my banana bread. Place 200g of any unsalted nuts in a preheated 180 degrees C oven on a baking tray. Bake for 8-10 minutes, then remove from the oven and leave to cool for at least 5 minutes. Tip the nuts into the food processor with a small pinch of sea salt and blitz. The blitzing takes a while for the nuts to be finely ground and then to turn into nut butter. Stop blitzing occasionally and scrape down the the sides of the processor. When the nut butter is the consistency you personally like – from crunchy through to super smooth – store in a jar. 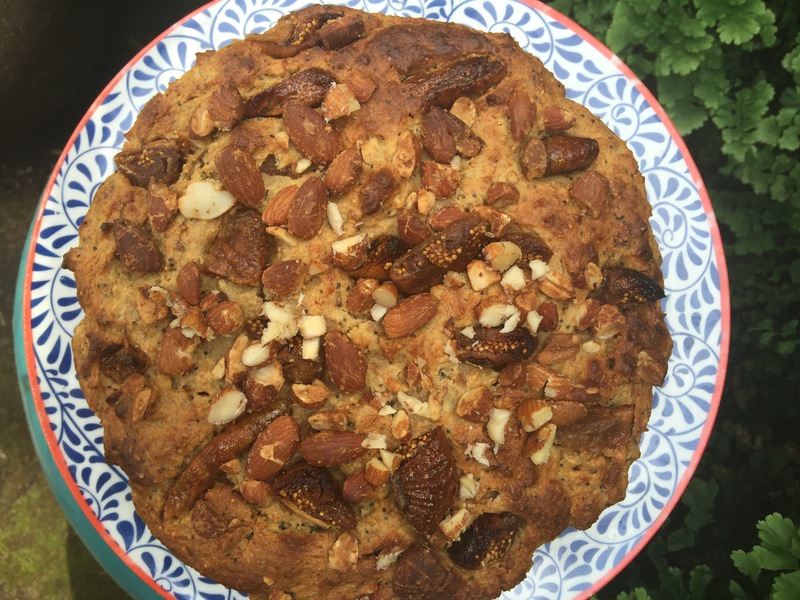 Posted in Bread, Breakfast, Cakes, Healthy, Jamie Oliver, Sweet Food and tagged almonds, apple, bananas, brazil nuts, Everyday Super Foods, figs, Jamie Oliver, nut butter, seeds, snack, wholemeal, yoghurt. Bookmark the permalink. Super food, super easy and super good! Jamie’s latest book Everyday Super Food is a bit of a revelation, crammed full of beautiful, colourful, easy recipes that are really healthy. The research, the nutritional information, and the carefully planned and written recipes make this book a must-read and a must-cook. I’m big on flavour, and what I’ve cooked so far is bursting with it …I can’t wait to cook more! If you love cooking, love really tasty food, and would like to feel that you are doing your bit to eat healthily, then get Everday Super Food. It’s common sense, not faddish, and do-able! I made Smoothie Pancakes with Berries, Banana, Yoghurt and Nuts today. I went for blueberries, next time I’ll try raspberries. I didn’t realize till I was making the recipe that there was no sugar – the blueberries are sweet enough – even for the sweet tooth of this quirky writer! The drizzle of honey on the pancakes themselves when serving adds that little extra sweetness which is nice. Here is Jamie’s recipe very slightly tweaked. Blitz half the berries, peeled banana, milk, egg and flour in a food processor or blender to make a smooth pancake batter. Fold in the remaining berries. Place a large non-stick frying pan on a medium high heat. When hot, put some batter into the frying pan to make large pancakes or small ones. I went for smallish. Cook for a couple of minutes on each side, or until crisp and browned. Jamie suggests flipping them for an additional 30 seconds each side to ensure they are super crispy. This seemed to work for me. You can serve whole, or slice the pancakes in half so you can see the fruit. Serve with a spoonful or two of yoghurt, a sprinkling of cinnamon, some chopped nuts and a drizzle of honey over the whole lot. Delish. 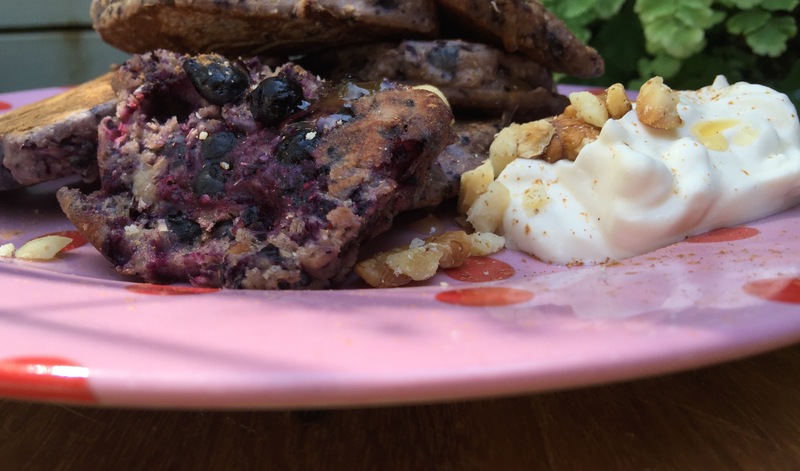 Posted in Breakfast, Healthy, Jamie Oliver, Pancakes, Crumpets and Waffles, Sweet Food and tagged banana, blueberries, Everyday Super Foods, hazelnuts, healthy, honey, Jamie Oliver, nutrition, pecans, raspberries, vegetarian, walnuts, yoghurt. Bookmark the permalink.